In the next issue of Jewish Currents, which will be out in the first week of September, we have two important articles about Lithuania — specifically about anti-Semitism and the investigation of three elderly Jewish partisans that has been undertaken by Lithuanian prosecutors concerning a 1944 military action by Soviet and Jewish partisans that took the lives of Lithuanian villagers. One article is by Rokhl Kafrissen, our “Rootless Cosmopolitan" columnist and website editor, who is currently in Vilnius (Vilne) at the Yiddish Institute. Two days ago, the Jewish Community Center in Vilnius was defaced with swastikas, anti-Semitic slogans and other repellent graffiti. You can see photos and share Rokhl's thoughts by reading her “Rootless Cosmopolitan” blog at our website (http://rokhl.blogspot.com/). The second article is by a former Jewish partisan who lives in Toronto, Sara Ginaite. It was forwarded to us by Dovid Katz in Vilna, and we have agreed to post it to our website before it appears in print. What follows is Sara Ginaite's opinion piece on the Lithuanian situation. She is pictured here in 1944. Sara Ginaite, a native of Kaunas, was incarcerated in the Kovno (Kaunas) Ghetto and lost almost her entire family in the Holocaust. 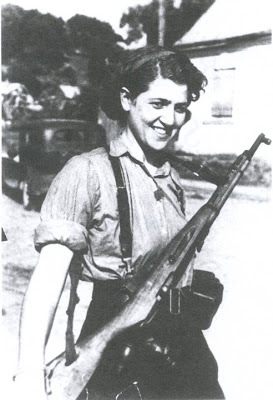 She escaped into the forests and joined the anti-Nazi partisans. After the war, she was a professor of political economy at Vilnius University for almost twenty-five years before emigrating to Canada in 1983. She published ten books in Vilnius and another two in Toronto,where she taught social science at York University. She was instrumental in arranging for Yad Vashem to honor a Lithuanian family that saved a Jewish child during the Holocaust and has recently negotiated exchange student agreements between Vilnius and Toronto Universities. Her best-known work on the Holocaust is Resistance and Survival: The Jewish Community of Kaunas, 1941-1944 (2005). Recent actions by the prosecutor general in Lithuania, who seems to have been pressured by some to discredit Jewish anti-Nazi partisans, are regrettable. Three elderly Jewish partisans are today being investigated in connection with events at the end of January, 1944 — a military action against an armed village, Koniuchy (now Kaniukai), in the Rudnicky forest area, in which thirty-eight villagers were killed. Lithuania declared independence in 1918 and became a democratic republic. If Lithuania had been allowed to select its own future, I would surely not be writing this article today. Unfortunately, Lithuania suffered from two cruel annexations. During the Nazi occupation (1941-1944), over two hundred thousand Jews in Lithuania were murdered by the Nazis and their Lithuanian henchmen, totally destroying a vibrant community once famed as a center of Jewish culture. Among the victims was almost all of my extended family. During the periods of Soviet repression (1940-1941 and 1944-1991), over 74,500 Lithuanian citizens perished, including Jews, Russians, Poles and people of other faiths and ethnicities. Many more were oppressed. About twenty years have now passed since Lithuania freed itself from Soviet occupation and once again became an independent, democratic republic. Its informal, unspoken position has been not to prosecute either the Nazi war criminals or the Soviet oppressors: Lithuanian courts have convicted only two or three of those who participated in killing the Jews and two or three active members of the Ministry for Internal Affairs of the Soviet regime. Taking into consideration the huge number of victims, it looked somewhat strange. Yet the majority of Lithuanians have agreed with this pragmatic approach. It hardly makes sense to begin the prosecution of Nazi war criminals today, since almost all of them are dead — and the Soviet collaborators are too old. In this context, it is hard to understand the strange new action of opening, in 2008, a pre-trial investigation of the anti-Nazi partisans’ wartime actions. It is also very strange that the prosecutor did not explain the aim of the investigation and his special and very public attention to the Jewish partisans. All this has alarmed me, as a former partisan. It has alarmed, as well, many other Jews around the world, especially Holocaust survivors and World War II veterans of the Allied forces. It has made us suspicious that the prosecutor intends to prosecute (or, at least, intimidate or publicly defame) those who suffered the most and are guilty the least. Jews did not join the partisans as a normal act of choice. We were forced to fight the Nazis to save ourselves from extermination. We took the gun in our hands in a desperate situation, when our parents, brothers and sisters were murdered, when children were grabbed from their mothers and sent to their gruesome death. We fought in order to survive; we fought against fascism, which was our enemy, the enemy of all democratic forces and the enemy of Lithuania. The activity of the Jewish partisans was self-defense — in the face of the most overwhelming instance of genocide in human history. In contrast to Lithuanian collaborators, who volunteered to put to death their unarmed civilian Jewish neighbors, and Soviet collaborators, who also volunteered to kill and oppress the Lithuanians, the Jewish partisans’ aim was not to kill anyone, not to ‘inherit’ the property of a murdered people, but to fight our common enemy. However, in a military action, you cannot avoid civilian casualties and death. That is the ugly reality of war, particularly a war of partisans who live in the forest and do battle against a world power. During the events in Koniuchy, I was not in the Rudnicky forest. I was on assignment to return to the Kaunas (Kovno) Ghetto to prepare a group of ghetto fighters to escape to the forest. I cannot comment, therefore, on the details of the event. I can say this, however: In our own interest, we tried to keep friendly relations with the villagers in the Rudnicky forest. We were never encouraged to harass or hurt them. In order to survive, we did have to collect food wherever we could, often from hostile villagers, but we tried as far as possible to seize food from German food storage areas or transports of food headed for Germany. But we didn’t always have the luxury of choice. If not for the war, I would have preferred to eat together with my family the dinner prepared by my mother, not to risk my life confiscating a cow from a local peasant. Such a confiscation, and the attack that followed by hostile villagers, during which two of our partisans were killed and a third captured and handed over to the Nazi-controlled Lithuanian police, is described in my book, Resistance and Survival. There were many villagers, hostile to the partisans, who were organized into armed groups, supplied by the Germans. Yes, they were villagers, but no, they were not unarmed civilians. Such a conflict was most likely the reason for the tragedy in Koniuchy. Prosecutors can easily turn into agents of injustice if they begin campaigns on ethnic or political grounds that have little to do with the work of identifying specific crimes and seeking to bring to a fair trial their alleged perpetrators. I invite the general prosecutor to put everything into its rightful context and not pursue a policy that appears to be based on ethnic targeting. The first step is to stop and ask: Why now, in 2008, schedule the pre-trial investigation of the circumstances of the event in Koniuchy, instead of examining the murder of 74,500 Lithuanian citizens during Soviet rule — and, yes, into the issue of who took part in the murder of two hundred thousand Jewish citizens of Lithuania during the Holocaust? Any request for bringing to justice the Nazi war criminals and the Soviet oppressors and killers is described as “too late.” Strangely, however, it has just become not too late to use the Lithuanian justice system to discredit those who fought against the Nazis. How can one not be humiliated by this selective justice, which is, in practice, directed exclusively toward the few surviving Jewish partisans? Investigation of the Koniuchy case is not justice. It is a manipulation of justice, with the goal of forming a negative image of the Jewish partisans and of Holocaust survivors generally. A state prosecutor need not allow himself to become the instrument of some Lithuanian factions who support the idea of collective guilt and collective responsibility. But it looks as if the prosecutor has surrendered to pressure and has begun this useless investigation knowing perfectly well that he is not going to charge any concrete person with any concrete alleged crime. The proceedings will only heighten tensions between Lithuanians and Jews, and pave the way to hatred and accusation. The defacing of the Vilnius Jewish Community Center with swastikas and anti-Semitic slogans on August 10th is a disturbing example of what may follow. Perhaps certain organizations and the extreme right-wing press welcome such an outcome, but I doubt that this is so of the Lithuanian government. Over sixty years have passed since the defeat of the Nazis, and almost twenty since the restoration of the independent democratic Lithuanian Republic. According to my understanding, significant motivations for conflict and tensions between Lithuanians and Jews do not exist anymore. We have to face the reality: Virtually all those who committed genocide against Lithuanian Jews are dead. At the same time, no one should forget the contribution of the Jewish community to the development of the first Lithuanian Republic between the two world wars. Jews were a most loyal ethnic minority in Lithuania. Serving in national infantry battalions, Lithuania’s Jews actively participated in the country’s 1918-1919 battles for independence. They defended Lithuania’s interests and political aims during the Polish ultimatum of 1938 and the Klaipeda (Memel) crisis. Jewish organizations and many Jewish authorities helped to enhance Lithuania’s international stature and contributed to the development of its culture and economy. It is high time to pass the investigation of Lithuania’s 20th-century history to historians and educators, not to prosecutors and judges. For some time, I have been saying that anti-Zionism is the most powerful political force on earth today. I must reconsider my view. The Lithuania story shows that the most powerful force is anti-Semitism, even when there is no way to link it to anti-Zionism. Thanks for posting this Larry. It was good to read the first-hand report. Also, there is a similar controversy in Poland at the moment, about Jewish partisans who are being accused of committing a massacre. It is in response to an upcoming film on the Partisans, titled "Defiance." The story is available at The Forward website. The most surprising thing about this was my reaction. I was not surprised at all. The deep strains of Eastern European anti-semitism masquerading as anti-communism continue to this day. I was surprised. Poland, in contrast, has really been dealing successfully with overcoming anti-Semitic attitudes. It has an annual klezmer festival, has preserved synagogues and other historic sites, and is the least anti-Israel country in Europe, except perhaps for Germany. Lithuania has gone out of its way to attack old people who survived the Holocaust. Hey, you know, there is a cool website/org called The Jewish Partisans Education Foundation, or JPEF, that has all the info you'll ever want on the partisans. You guys should really check it out, it's incredibly thorough and does the partisans justice.